StephaneRolland couture show in Paris. FRENCH couturier's Stéphane Rolland new show opened in velvety darkness with the liltingly melancholic sounds of violoncellist François Salque lit by a single circle of light on the stage at Paris’ Théâtre National de l’Opéra Comique. Singers from Les Cœurs Parisiens later appeared and heightened the sense of atmosphere. The music accompanied a poetic and subtly dramatic show of flowing, ethereal gowns in pale silky tones of pearly cream and white with dashes of gleaming, silver and crystalline sparkle. The fluid creations were silhouetted with abstract, sculptural forms, some in the shape of flowers or wings. The designer has said his favourite sculpture is the Victory of Samothrace, also called the Nike of Samothrace, a marble Hellenistic sculpture of Nike created in the 2nd century BC. Wings are a potent emblem in his work and his interest was first piqued when he saw the sculpture as a child at the Louvre and was enthralled by the surging sense of movement and the exquisite drapery. Today, the couturier also sculpts and sees it as an extension of his work as a fashion designer. Past collections by Mr Rolland have been inspired by architecture, sculpture or art, from Velasquez to Anish Kapoor. But this time the leitmotif was the meeting of different artists. 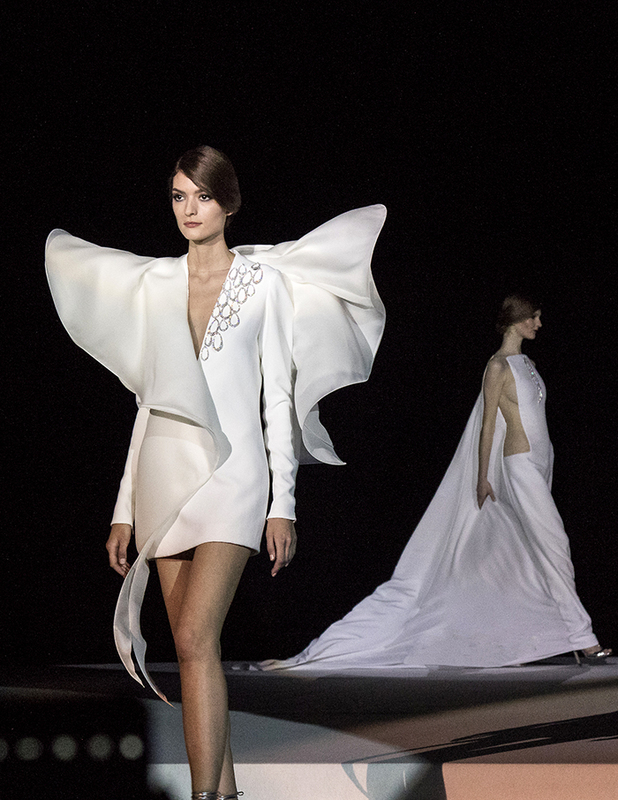 Stephane Rolland says these artistic encounters expand and inform his work. 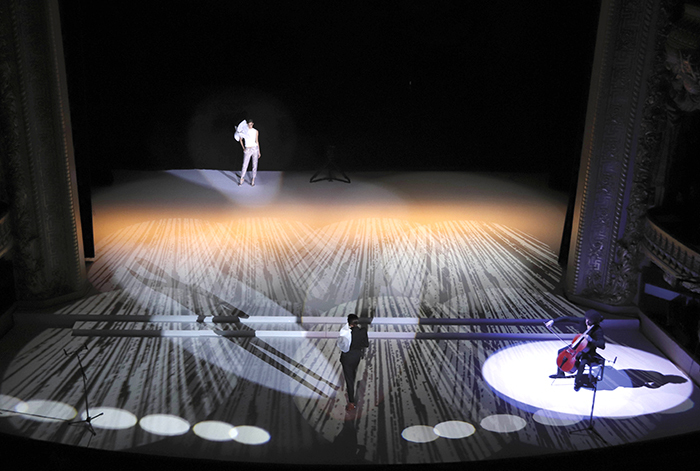 He loved the emotion created by musician François Salque's recitals and wanted to include that in his new collection. The designer also formed a new creative partnership with jeweller Albert Boghossian after deciding he wanted to create something new and entirely different for this collection. Gowns were embellished with the intricate jewellery pieces. The collection's standouts are billowing capes and long, pleated skirts and creamy, floating satin gowns decorated with glinting, silver disks, like wearing a piece of mid-century modern design. 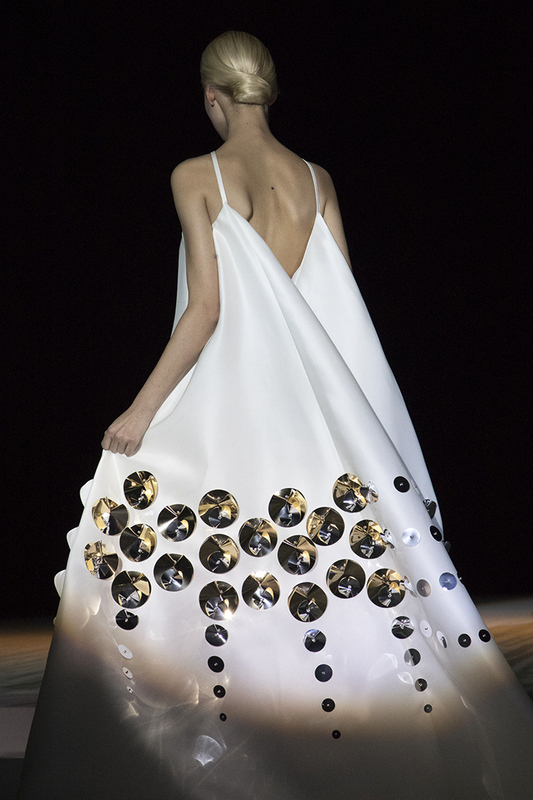 Softly falling, voluminous satin crepe was the other central theme of the show in tones of white, sand and amber. In contrast to the fluid gowns, were tailored trousers, coats and shorts. Although architecture is often one of Mr. Rolland's starting points for designing a collection, this time he wanted to "let go" and create pieces that were more gentle in form and shape. The theme of the show was "art and nonchalance" and although there were pieces designed like sculpture he combined this ethos with more relaxed creations such as slimline, lamé pants, white leather shorts and tops paired with flannel, wide trousers and jumpsuits in white crepe. Simplicity and comfort were emphasised with long, voluminous coats in platinum lamé or black wool that had an androgynous look. The couturier has said he grew up surrounded by black-and-white photographs as his mother worked at well-known Parisian photographic studio, Pictorial Service. The sense of volume, contrast and movement Stephane Rolland noted in the photographs as a child were to become integral to his work later as a fashion designer and can be seen in this new collection today. Couturier Stephane Rolland at the finale of his show. Mr Rolland had an early and fast rise in the fashion world, working at Balenciaga in his early twenties as creative director of menswear. By the time he was 24 year old he had launched his own prêt-à-porter business and worked at this for six years before becoming artistic director of another haute couture fashion house for a decade. He also worked as a costume designer and was nominated twice for the prestigious Molière awards, becoming an official partner of the Cannes Film Festival. In 2007, Stephane Rolland presented a couture collection under his own name and today is a full member of the Chambre Syndicale de la Haute Couture. Mr. Rolland is one of just 14 fashion designers based in Paris and nominated by the Chambre Syndicale de la Haute Couture as “Grand Couturier,” which also allows his fashion house's collections to officially be called haute couture. The satin gowns are embroidered with the jewellery pieces made in collaboration with jeweller Albert Boghossian. Stéphane Rolland also sculpts and sees this creative work as an extension of his work as a fashion designer. The designer has said his favourite sculpture is the Victory of Samothrace, also called the Nike of Samothrace, a marble Hellenistic sculpture of Nike created in the 2nd century BC. 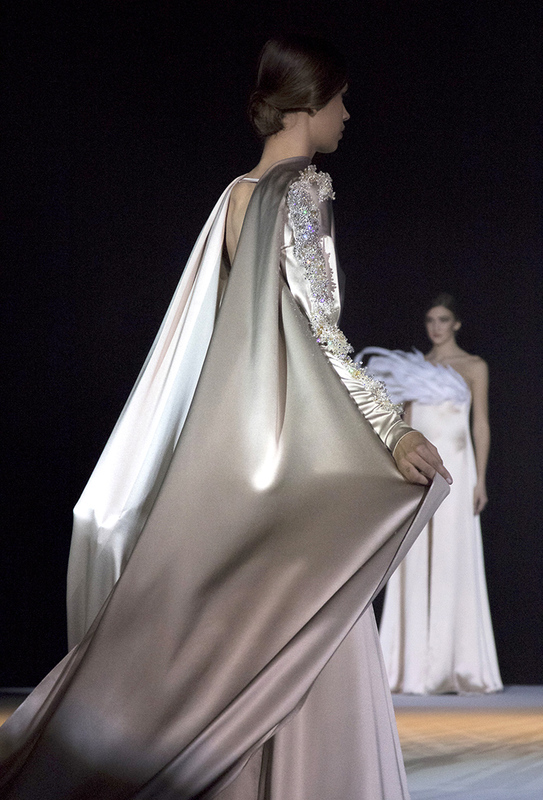 Wings are potent emblem for Stephane Rolland's work and his interest was first piqued when he saw the Victory of Samothrace as a child at the Louvre and was enthralled by the surging sense of movement and the exquisite drapery. Past collections by Mr Rolland have been inspired by architecture, sculpture or art, from Velasquez to Anish Kapoor. But this time the leitmotif was the meeting of different artists, including jeweller Albert Boghossian. 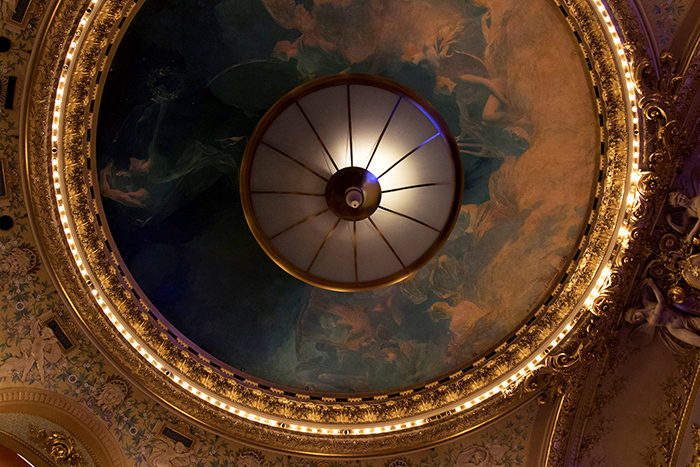 The gilded dome and frescoes of the Opéra Comique in Paris where the show was held. Stephane Rolland grew up surrounded by black-and-white photographs and they influenced his sense of volume, contrast and movement. The collection included billowing floating satin gowns embellished with fabric flowers. The music accompanied a poetic and subtly dramatic show of flowing, ethereal gowns in pale silky tones of pearly cream and white with dashes of gleaming, silver and crystalline sparkle. 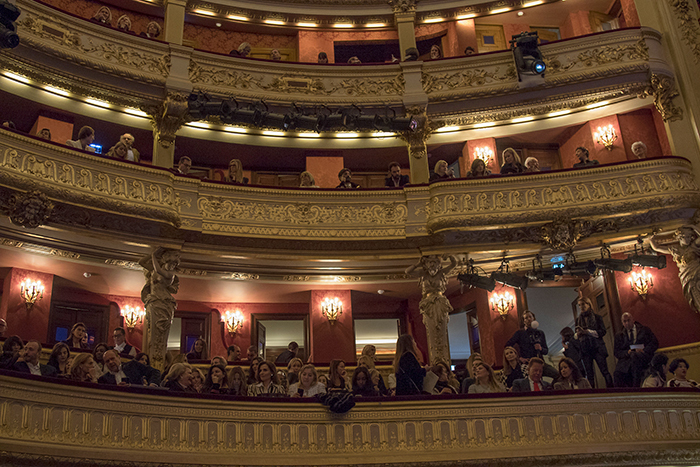 The guests of the Stephane Rolland show at the Théâtre National de l’Opéra Comique. The sense of volume, contrast and movement Stephane Rolland noted in the photographs as a child were to become integral to his work later as a fashion designer and can be seen in this new collection today. In 2007, Stephane Rolland presented his first couture collection under his own name and today is a full member of the Chambre Syndicale de la Haute Couture. Mr. Rolland is one of just 14 fashion designers based in Paris and nominated by the Chambre Syndicale de la Haute Couture as “Grand Couturier,” which also allows his fashion house's collections to offcially be called haute couture. The finale of the haute couture show by Stephane Rolland.